The number of families finding themselves homeless over the past year has risen by nearly a fifth on five years ago, official data shows. Government figures show 59,090 households were accepted as homeless by councils in England between April 2016 and March 2017. This is 17% higher than the number made homeless in the year 2011-12. The Department for Communities and Local Government says it is investing £550m to 2020 to tackle the issue. But the figures, just published, also show nearly 200,000 people are at risk of homelessness and have sought help through their local authority. Homelessness and housing charity Shelter said the fire tragedy at Grenfell Tower had put the issue of homelessness into the spotlight. 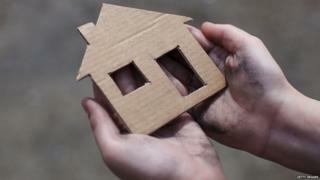 Its director of communications, Anne Baxendale, said: "While Shelter is calling for those affected to be placed in good quality temporary accommodation nearby, and [we] hope officials make good on their promise to do so, we know many local authorities simply don't have enough affordable accommodation for those on low incomes. "It's a similar story across all London boroughs and the country more widely, so it's no surprise that today's homelessness stats reveal the problem is getting worse nationally, with more households becoming homeless every year." The charity highlighted that a quarter of households staying in temporary accommodation had been doing so for more than a year. While 1,290 families were spending more than the six-week legal limit living in bed and breakfast accommodation. A Department for Communities and Local Government spokesman said: "This government is determined to help the most vulnerable in society, and is committed to ensuring people always have a roof over their heads. "Statutory homelessness acceptances are less than half the 2003 peak. "However, the government is committed to do more to prevent more people becoming homeless in the first place."